Darth Vader is a character from Star Wars. 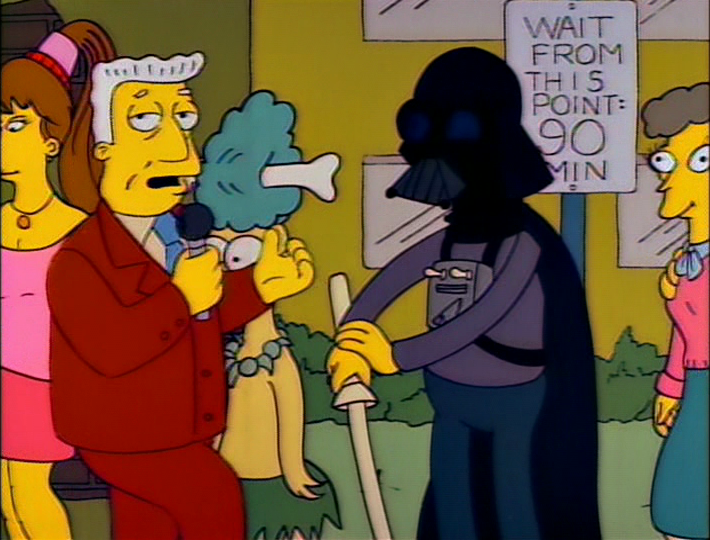 When Abraham Simpson was giving away Bea Simmons's money (after she passed away and left him a sizeable bequest), Darth Vader was one of the people in line requesting to receive some of it. 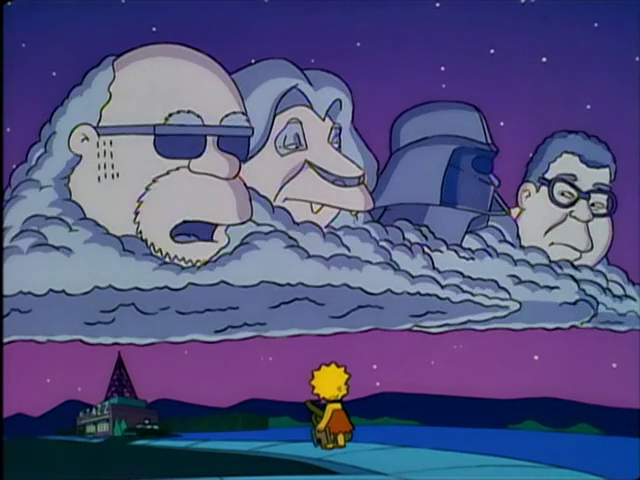 Vader later appeared to Lisa in the clouds along with Mufasa, James Earl Jones and Bleeding Gums Murphy, just after he died. 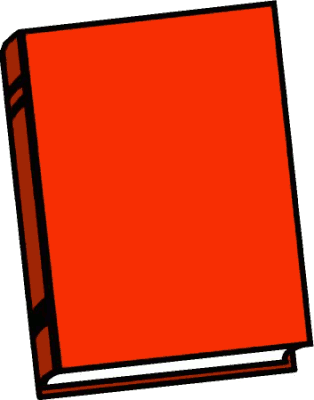 On Comic Book Guy's list of greatest quotes of all time is "The Force is strong in this one." by Darth Vader. During the song "High to Be Loathed", Mr. Burns mentions Skeletor, and makes his shadow, among lots of other villains. L-R: Bleeding Gums Murphy, Mufasa, Darth Vader, and James Earl Jones. 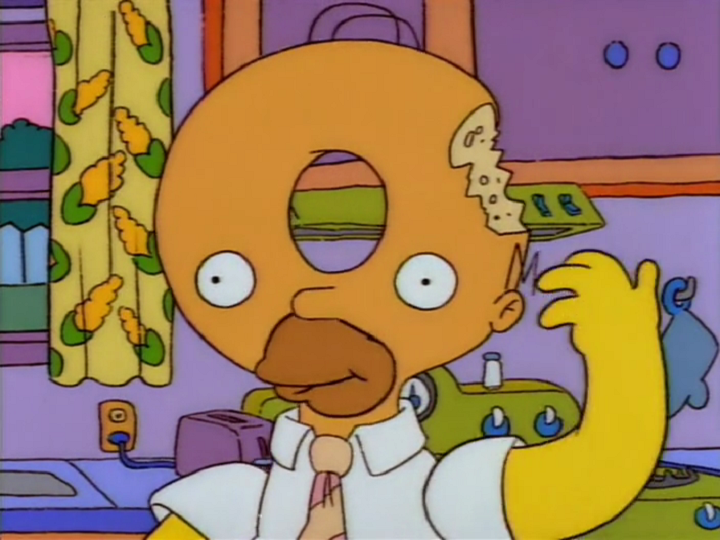 Homer said after watching The Empire Strikes Back: "Who would have known that Darth Vader is Luke Skywalker's father?" greatly annoying the other moviegoers by spoiling the movie for the people in line who had yet to see it. A man made a caricature of Darth Vader in a bathing suit surfing. Marge makes a Darth Vader mask and claims to be Star Wars. A person is dressed up as Darth Vader at a Sci-Fi convention. In a mash-up by Bart with Ruth Bader Ginsburg and Darth Vader you get Darth Vader Ginsburg. Dr. Hibbert dresses up as Darth Vader and is quickly arrested for violating an ordinance against impersonating movie characters. Modified on February 23, 2018, at 16:54.